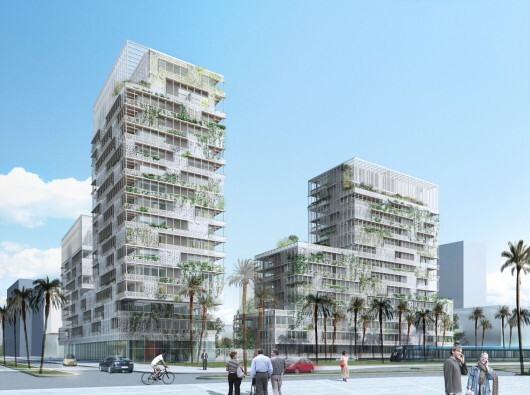 Herreros Arquitectos just sent us their recent project for a mixed-use building in Casablanca, Morocco. Resulting from a series of urban, spatial, formal and sustainable variables, the project--which includes housing, commercial and athletic spaces--is characterized by a permeable facade that directly responds to the climate. The repeated decorative element is a reinterpretation of a traditional geometric code that is common to the region. The project was featured in the Moroccan Pavilion in the 2014 Venice Biennale. Find the images and product description, after the break. From the Architect. The volumetric options made available through the regulations are an invitation to play with the silhouettes of buildings of a type which combines the urban character which is generated by the lower floors and which complement the perimeter of the blocks with the range of heights adopted by the upper stories. It stages three ways of inhabiting the city stepwise, devoting the ground floor to garden villas and the intermediate floors to ‘urban dwellings’, while casting a brand new skylight by mean of isolated towers. The result provides an enormous volumetric potential for the design from which the broken outlines proposed are drawn, permitting terraces and sheltered areas to be generated to increase the quality of the dwellings while aiding in the implementation of a contemporary selection of villa-type properties. The layout described seeks to become a conscious plunging into the prototypical "riads" in which a permeable wall encloses the Andalusian Arabic-style gardens which are at once hidden as well as being "felt" through transversal visions which doubly connect each dwelling with the city and the intimate yet exuberant spaces setting out their more intriguing plots to relate patios with roofs and streets and then with gardens to convert the constructed mass into an architecturally charged urban landscape. The establishing of the elevation is thus the result of a series of equations where the presence in a public space comes together with the views, both close and distant along with the orientation especially with the strategically managed exposure to the sun. Diversity is a substantial aid to the variety sought by the design: dwellings of different types and sizes which are closely linked to their setting, in blocks with large terraces, their roofs, etc., all of which is complemented by the provision of commercial premises, a swimming pool and a gymnasium for local residents. The construction of a permeable façade which is able to relate to the climatic variables while generating open spaces which are associated with each dwelling while at the same time being an integral part of the overall concept which seeks to achieve a unique character for the whole with a traditional decorative finish in latticework reinterpreted in a contemporary geometry that alternates permeabilities while incorporating natural elements in search of an apparently random set of full and empty figures clearly recalling local influences full of environmentally friendly intentions. These aesthetic features allow the buildings to take on, during the beautiful nights in Casablanca, a different and enigmatic form which is filled with colour in an expression of a neighbour community pleased to be able to inhabit this place.